Combines a high-quality. semi-weighted keyboard with a full DAW and plug-in control surface. 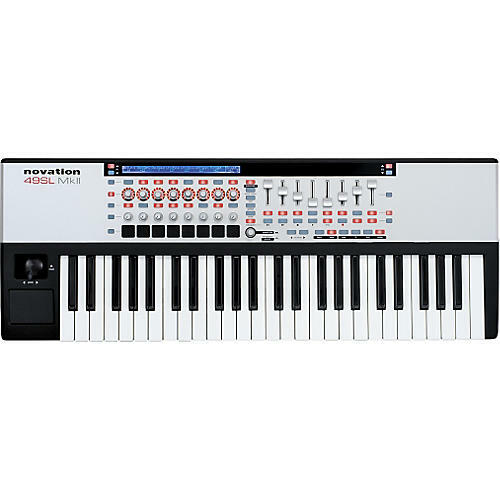 The Novation 49SL MkII Keyboard Controller is designed to give modern DAW users every dimension of hardware control. The 49SL MkII makes a hands-on approach to navigating software possible, and offers control over audio mixing and software plug-ins. It represents extraordinary value as a controller, integrating a DAW control surface with a quality semi-weighted keyboard (with after-touch) and the most intuitive plug-in mapping capabilities available - presided over by Automap 3 PRO; unquestionably the most advanced control software on the market. 49SL MkII upholds Novation's reputation for building quality hardware (like the SL MkI, they will also appeal to performers who need a well-constructed keyboard onstage). Quality is not just reflected in their robustness, but more importantly in the way the 49SL MkII has been designed with every detail calculated to maximize workflow. The 49SL MkII's visually feeds back all controller information to the user with back lit buttons and encoder LED rings. The difficulty with other control surfaces is in knowing what is assigned to what. 49SL MkII has a giant 144-character ultrabright LCD screen that displays all the parameter names and values for the currently selected row of controllers. All 8 faders and 16 knobs are touch sensitive, so the moment one is touched, the display shows the names and values on that row and puts brackets around the controller that is currently being touched. This enables the user to see which parameter is assigned to the controller without having to change the value, or refer to their software. 49SL MkII also has a dedicated 'Speed Dial' knob, which can be used to change the value of any parameter the cursor is positioned over without making any assignments whatsoever. The 49SL MkII has been designed to draw minimum current so it can be used as a USB buss-powered device, and an optional 9V DC power supply can be added for standalone use. As well as USB interfacing, the 49SL MkII has 1 MIDI in, 1 MIDI thru and 2 MIDI outs. The power behind the 49SL MkII's unique ability to map controllers at the touch of a button is contained within the included Automap software. Automap 3 PRO enables users to map controllers with incredible speed and ease-no more digging through MIDI continuous controller numbers, the Automap server takes care of it all. Automap's GUI gives the user a visual representation of all the current mappings on-screen, as well as the ability to save and manage mappings across different projects. There is also an option to only bring up the GUI when a controller on the 49SL MkII has been touched! Velocity-sensitive, semi-weighted action keyboard from Fatar, with assignable aftertouch. Novation delivers the feeling of playing an instrument, rather than just a computer peripheral. Brightly lit LED rings around the eight smooth encoders, and backlit buttons throughout provide instant visual feedback for every physical control, further reducing reliance on the computer screen. Frees the artist from being chained to the computer screen, placing all the essential data right alongside the relevant controls. Full control surface supporting ultraflexible DAW control and Auto-mappable plug-in controls, 16 knobs, 8 faders, and 32 assignable backlit LED buttons. 49SL MkII comes with Automap software which enables you to instantly map software parameters to faders, buttons, encoders and pots, and other controllers. Get the control power you need! Order yours now.